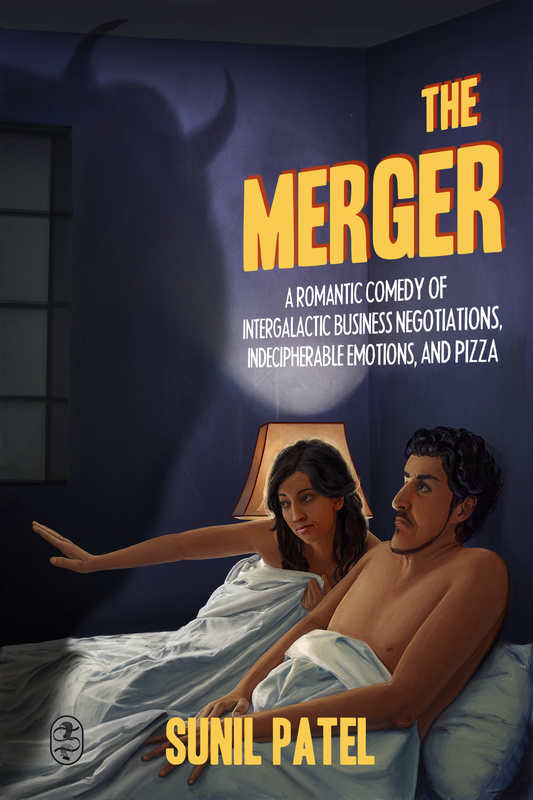 Tomorrow is June 23 and marks the date we publish the second short story in our summer 2015 line-up of tales of First Contact: The Merger: A Romantic Comedy of Intergalactic Business Negotiations, Indecipherable Emotions, and Pizza by Sunil Patel. This story, more than any others, approaches the First Contact theme in the most traditional (and wonderfully hilarious) sense–and we are delighted to turn the stage over to Sunil to talk about the inspirations and influences behind his story. 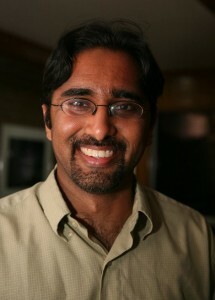 Please give a warm welcome to Sunil, everyone! Write what you know, the old adage goes. So I did. The Merger is based on a true story, not of alien possession but corporate merger. I had been working at the same company for seven years when in 2013 a Big Pharmaceutical Company acquired my company and I acquired a great deal of uncertainty. In addition to a great deal of money. To make matters more confusing, I decided to commit to becoming a published author, so my life was cracking under these seismic changes. I channeled all of my anxiety into an incredibly silly exercise in making myself laugh. That’s right, I sold a story I wrote as stress relief. Anything is possible, kids. I had to find some way to make what was happening funny, and there’s nothing funnier than a six-foot-tall alien blob with horns screeching, “Congratulations on your exciting opportunity!” That, to me, is one of the key lines in the whole story because it perfectly represents the way Big Pharmaceutical Company presented themselves to us: this will be great for you, we promise, we will change everything about your company that you love but it will be for the best, we might lay a bunch of you off but we’ll give you money, everything is wonderful. Anyone who has ever gone through a corporate merger will recognize the jargon in the Blarbsnarb’s dialogue, as I had plenty of corporate e-mails and a hefty merger agreement to pull language from. Once I came up with the basic metaphor of alien possession as corporate merger, it was a fun challenge to map as many parts of the process to the Blarbsnarb takeover as I could. I even had a lawyer friend look over a later draft to check that my story was legally sound, and he pointed out a perfect pun I couldn’t believe I hadn’t made yet. I come from a science background myself, so I relished the chance to make jokes about intestinal flora and mitochondria. I wrote this story to make myself laugh. I wrote this story to make myself laugh because I didn’t know whether I was about to lose my job and my life was going to become a giant mess, even though I would be getting substantial compensation as a result of the buy-out, and the astute reader will notice similarities between my personal conflicts and Paresh’s internal conflicts. Write what you know. And write what you don’t know. I was not married or dating anyone, but I found the story a way to explore how money can come between a couple. How are major life decisions different when they affect more than just you? Is a sudden windfall always good, no matter the cost? Money is a huge part of our culture and our lives, whether it’s ten dollars or ten million dollars, whether it’s coming from a faceless corporation or a faceless alien blob. You know, I did not make that “faceless” connection until just now. How deep does this metaphor go? Don’t tell my other stories, but The Merger was my favorite story. It felt the most personal, borne out of real-life conflict, forged in the fires of a FOGcon writing workshop, molded for a humorous anthology call. I was not laid off in 2013. I was laid off this year, the Blarbsnarb finally having decided they had no use for me after all. The Merger has been with me throughout this journey, and in a way it is me. If this is your First Contact with me, congratulations on your exciting opportunity. The Merger will be available on June 23, 2015. You’ll be able to read the short story in full for free here on The Book Smugglers, but we’ll also have a DRM-free ebook (EPUB, MOBI, AZK) that contains the story as well as a Q&A, essay from the author, and exclusive deleted scenes available for purchase on all major ebook retail sites. And read The Merger for free online on June 23, 2015.